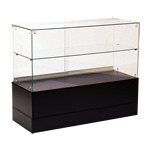 CWE Store Fixtures has a wide selection of display cases, showcases and counter available to order. Showcase and display lines range from high end to low end, from off the shelf to custom. We also offer an extensive selection of corner showcases, tower displays, modular jewelry showcases, pedestal cases, counters, cash stands, display tables, dump bins and many other display products.